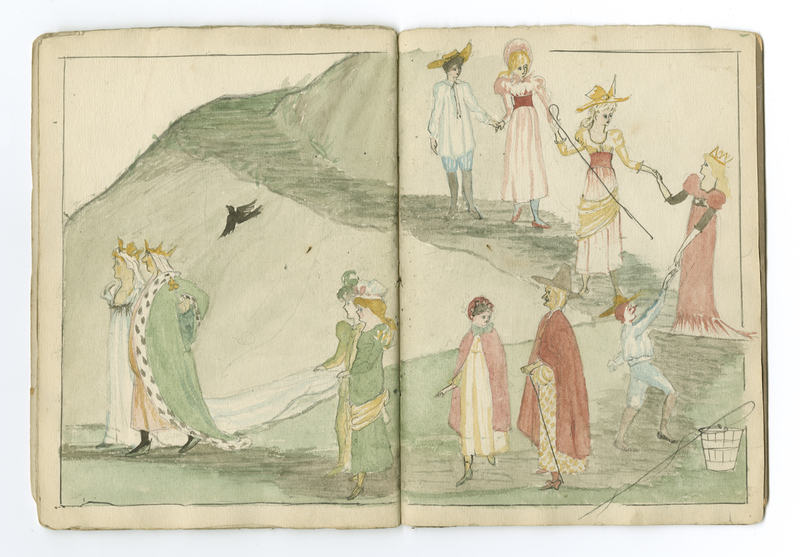 MS 760/2/29, Volume of coloured sketches of characters from Nursery Rhymes painted by Ivy Harper (1880-1932). Ivy Harper was the daughter of Edward Samuel Harper (1854-1941), who taught Life Drawing at Birmingham School of Art for over thirty years. Ivy had two brothers, Edward Steel Harper (1878-1951) and Guy Harper (1891-1961); all three became artists or art teachers. The family lived in Harborne, Birmingham. This charming little sketch book of nursery rhyme characters was presumably drawn by Ivy when she was a young girl – she later became an art teacher at King Edward’s Girls School, Camp Hill.